Strengths: Fedorov has been one of the best all-around hockey players for over two decades. He was fast and his defensive qualities were better than those of many defensemen. Whether playing for his club or for the national team, Fedorov’s leadership qualities were irreplaceable. Weaknesses: Sergei Fedorov’s production had been in decline in his last few seasons. He was no longer the dominant playmaker he previously was. Biography: As a boy growing up in Pskov – an ancient city near Russia’s western border – Sergei had a lot of potential as a hockey player. He was accepted by the legendary Red Army’s junior team at the age of 15. After a vigorous regimen of training, Fedorov did very well. Sergei became friends and linemates with fellow rising stars Pavel Bure and Alexander Mogilny. Their line helped “CCCP” not only win back-to-back junior championships, but the World Championships as well at the end of the 1980s and early 1990s. In 1990, Sergei took advantage of an opportunity to make it to the NHL. Fedorov’s defection was not as highly publicized as Mogilny’s, but it was still an important event for hockey. 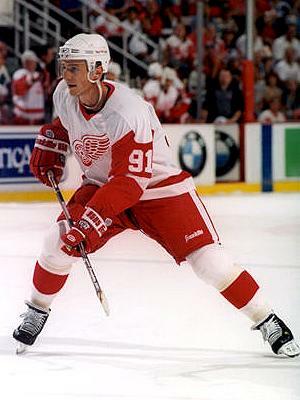 Not knowing English, Sergei joined the Detroit Red Wings with a new number – 91. After his first season Fedorov was chosen to the NHL’s all-rookie team. In the 1993-94 season, Fedorov trailed only Wayne Gretzky in league scoring! That year he won the Hart Trophy (as the Most Valuable Player), the Pearson Award (as MVP chosen by players), and the Selke Trophy (best defensive forward). 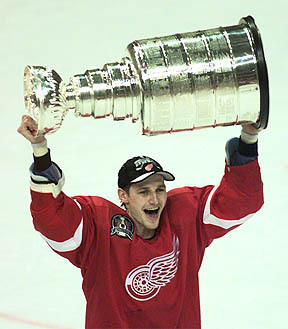 Sergei was a vital part of Detroit’s Stanley Cup wins in 1997 and 1998, although he missed most of the 1997-98 season due to a contract holdout. The Carolina Hurricanes offered him a $38 million 6-year deal, but the Red Wings matched it. The year before, Fedorov earned a whopping $20 million ($2 million salary + bonuses)! That money helped him create the Sergei Fedorov Fund that helps children not only in Detroit, but in Russia as well. Although becoming a U.S. citizen, Sergei of course continued to play for Russia. He was a key part of Russia’s silver and bronze medal finishes at the 1998 and 2002 Olympics. During the 2001-02 season under Scotty Bowman’s coaching, Fedorov experimentally played defense. Sergei is a rare player who can be committed to defense, but still be the best offensive player on the ice. This was shown in the 2002 playoffs, in which Fedorov recorded 19 points. In 2003, Sergei decided for a change and signed with the Mighty Ducks of Anaheim. In 2005, he was traded to the Columbus Blue Jackets. After a few mediocre non-playoff years, Fedorov rejuvenated with the Washington Capitals, where he had a leading role in taking them to the playoffs in 2008. In the same year, Fedorov made a successful return to the national team, playing on a line with his Capitals teammates Alexander Semin and Alexander Ovechkin, and leading Russia to its first World Championship gold medal since 1993. In 2009, Sergei returned to Russia to play with his brother Fedor for KHL’s Metallurg Magnitogorsk. Fedorov was an irreplaceable leader on Metallurg, but retired in 2012 after 26 years of professional hockey. Sergei is now the general manager of CSKA Moscow – the hockey club that made him a star.